Want to know more about your Police Department? 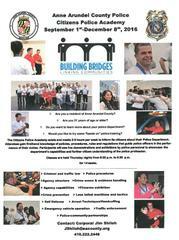 Attend the Citizens Police Academy this fall. Details attached. The Citizens Police Academy is an excellent way to learn more about how your Police Department works and how Officers are trained. It is taught in a relaxed environment with instruction by various Law Enforcement professionals. The attached flyer has more details about the Academy with contact information for questions and enrollment.